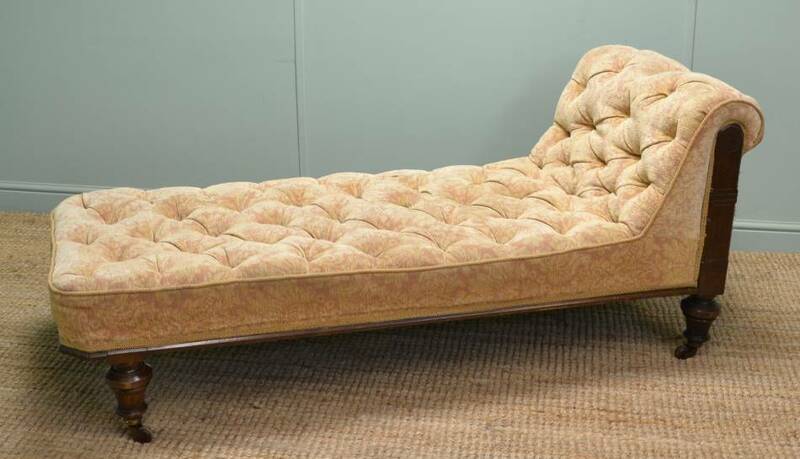 The antique settee also known as antique sofas were extended versions of the armchairs of the period. 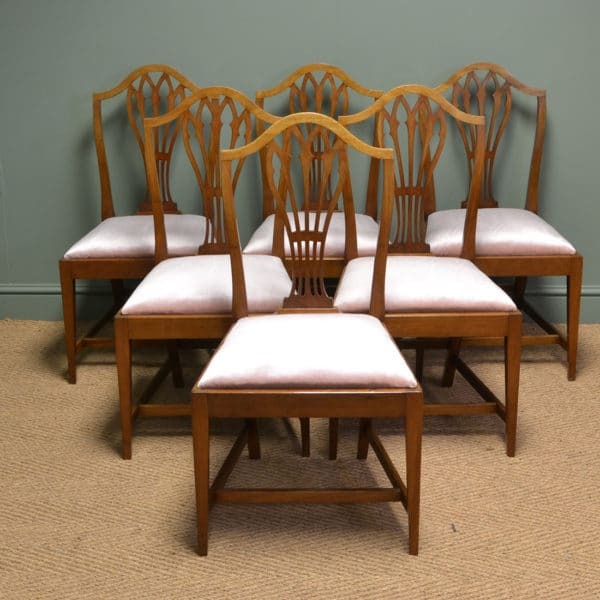 Most were upholstered or like Chippendales examples had wooden backs in two to four sections, repeating the single chair back. 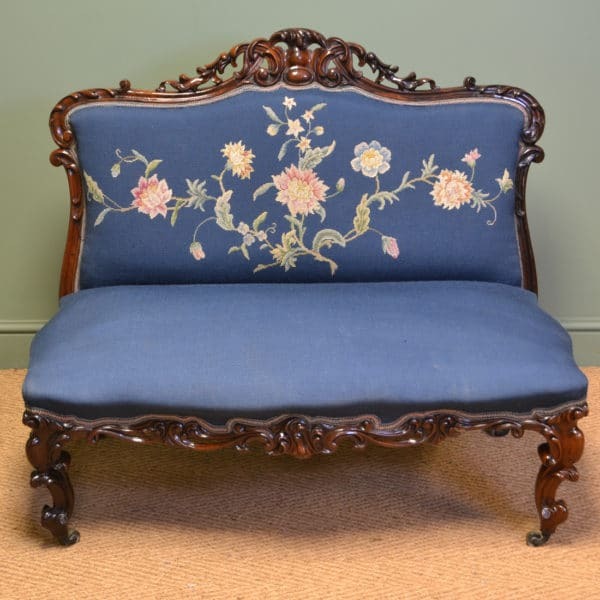 It was from around 1770 when the first fully upholstered settee appeared, and then the Regency couch or day bed was designed up to the exuberantly carved Victorian chaise-longue. 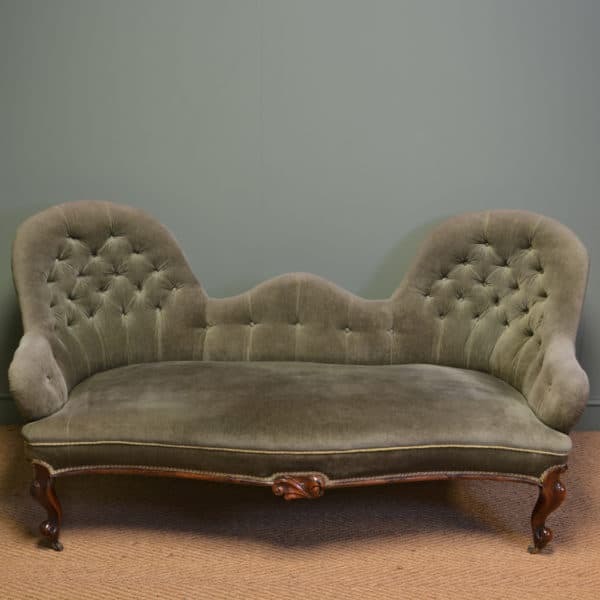 The Victorian period also produced the large heavy buttoned back chesterfield settee sometimes in leather upholstery. Victorian seating was designed for comfort so during this period the settee is usually well padded with often comfortable loose cushions and had coiled springs in the construction. Fabrics used were anything from tapestry to weaved but with modern homes, many are re-upholstered to a more neutral fabric to make them more suitable for today’s interiors. 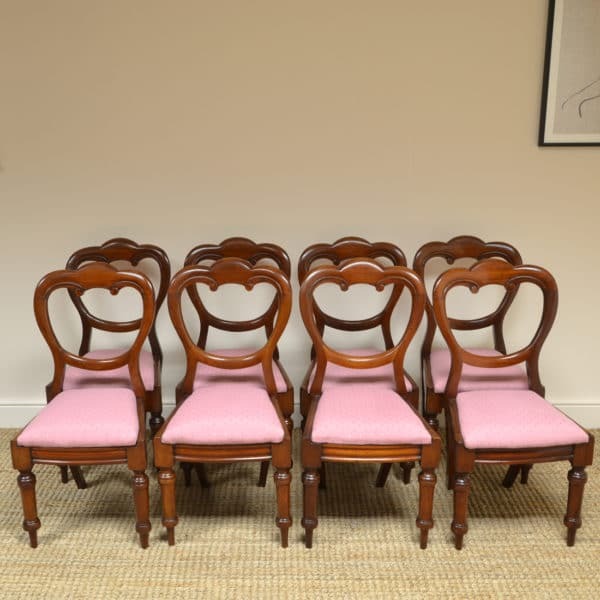 Have a look below at some of our beautiful antique chairs for sale along with good examples of antique settees. Below are a few examples of previously sold settees but if any particular style looks of interest please let us know as we do get many similar designs in stock and we can try to locate something similar. 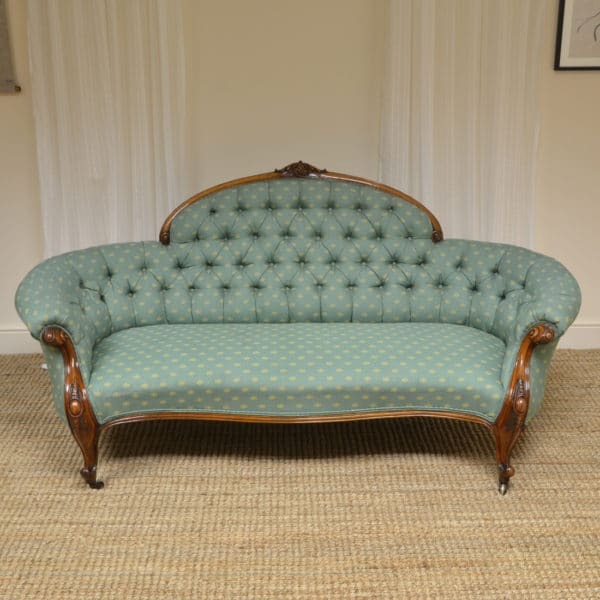 This Beautiful Edwardian Upholstered Antique Sofa / Settee dates from ca. 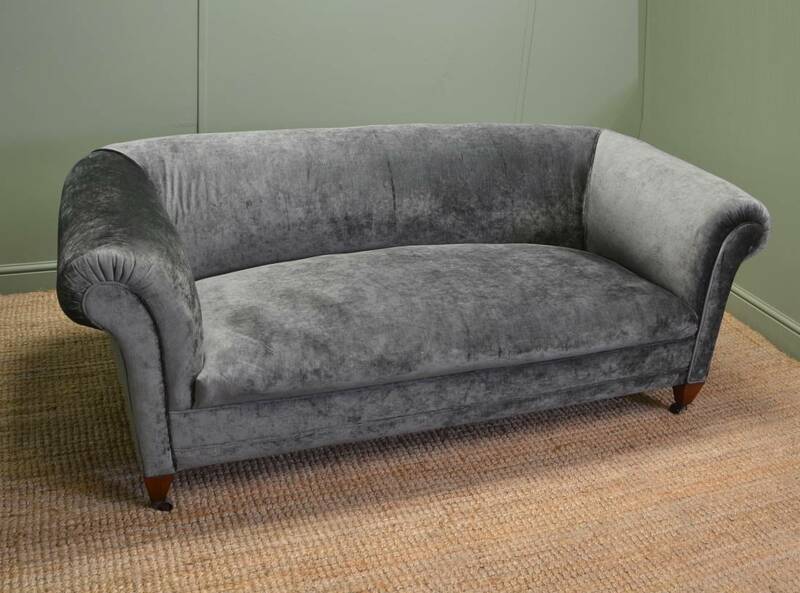 1900 and has been professionally re upholstered in a quality velvet from Art of the Loom with a matching piped trim. 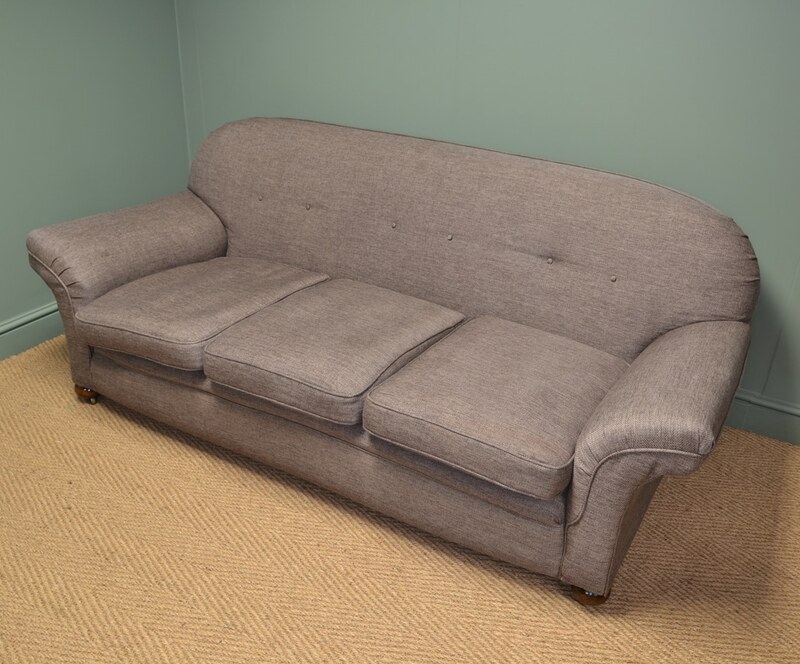 The sofa is very comfortable, with scrolled arms and standing on tapering mahogany legs, finished with castors. Regency Mahogany Sofa / Settee ca 1820. This beautiful antique Regency mahogany sofa / settee has a shaped back with beautiful swan carvings. The piece has two scrolled arms with beautiful floral carving, stands on four splayed legs with lion paw feet and has been recently upholstered in a striking floral fabric with two bolster cushions and matching braid trim. The piece is a rich mahogany colour with a striking grain, good patina, is in very good condition and has been beautifully cleaned using a traditional form of wax finishing. 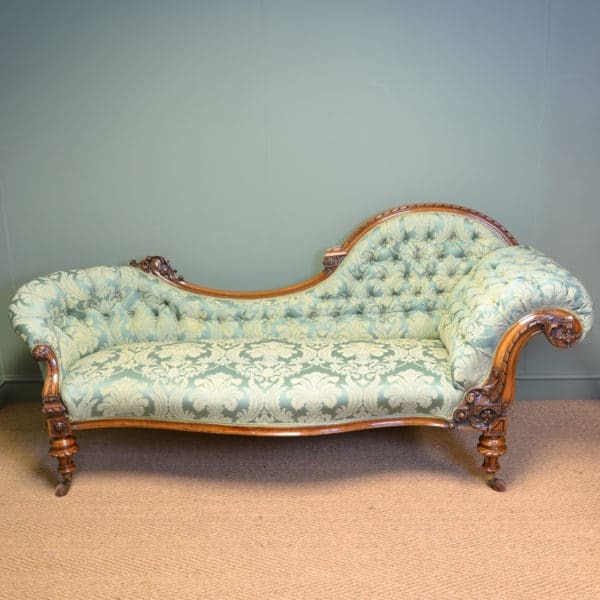 This Elegant Edwardian Mahogany Antique Salon Settee Is of Lovely Small Proportions and dates from around 1900. It has beautifully inlaid curved arms with elegant fretwork carved upright supports. 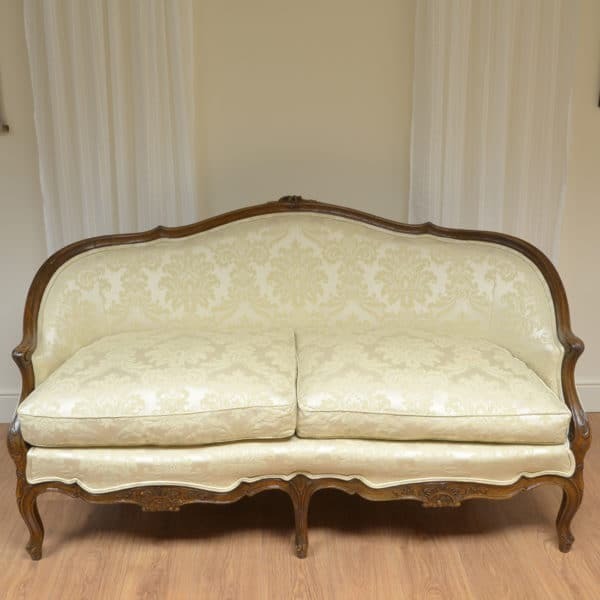 Regency, Mahogany Antique Sofa. 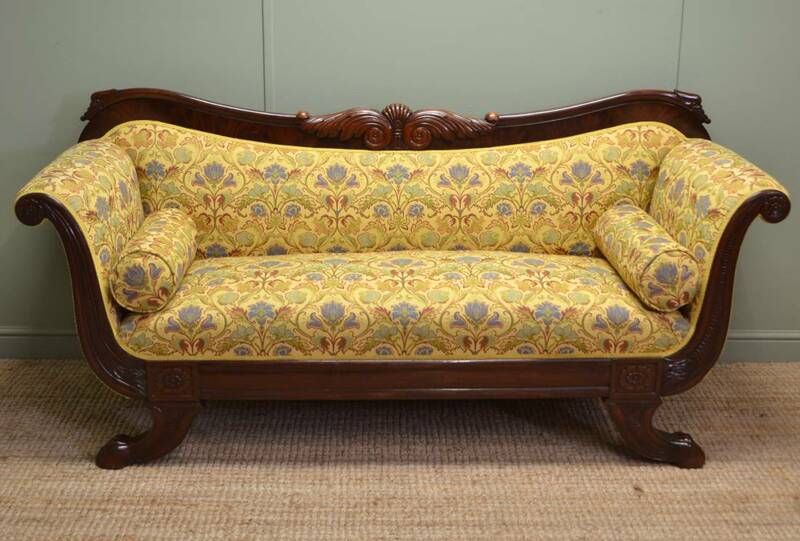 This delightful antique Regency sofa, circa 1830, has decorative scrolled arms and is constructed from mahogany. The frame has a beautifully moulded edge which leads into the delightfully scrolled arms. It stands on four turned feet with brass cup castors and has been later upholstered in a period style fabric that is good to go. 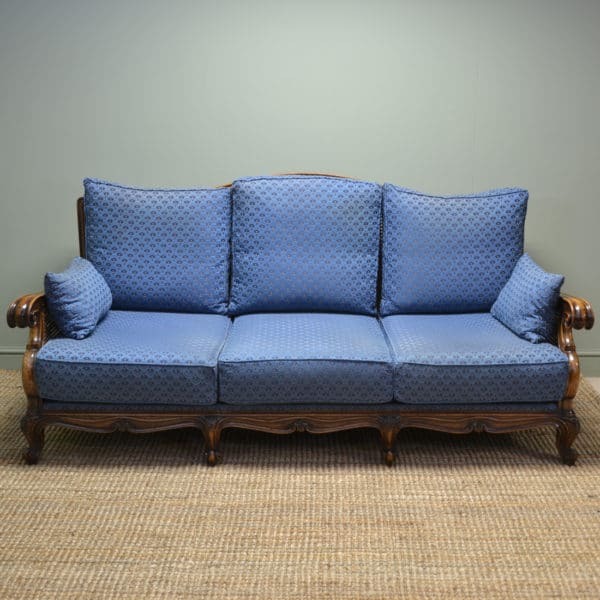 The sofa comes complete with two bolster cushions and the mahogany has aged to a wonderful rich dark shade with a striking grain, good patina, is in very good condition and has been beautifully cleaned using a traditional form of wax finishing. 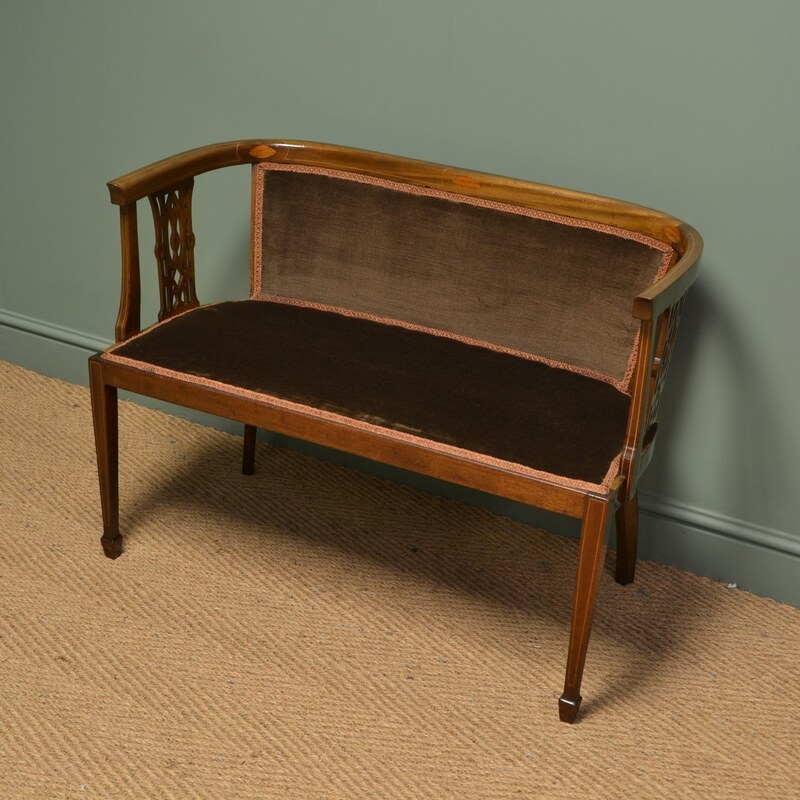 Victorian Walnut Antique Day Bed / Chaise Longue. 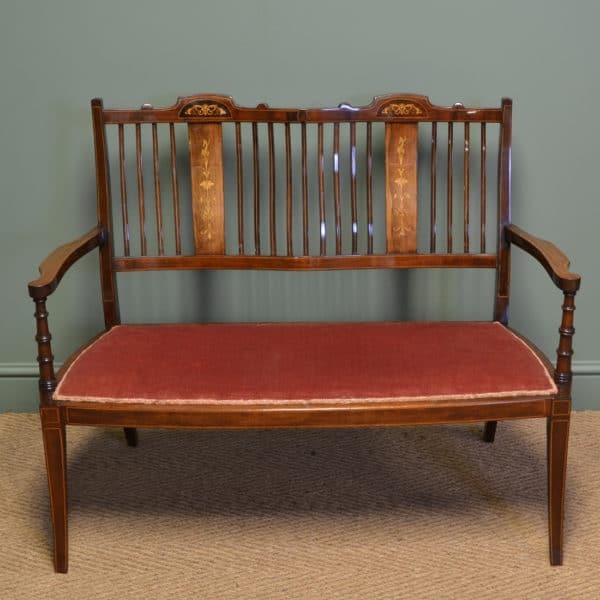 This walnut Victorian antique day bed / chaise longue dates from around 1890. With only a single raised curved end this day bed could either be placed against a wall or in the centre of a room for added drama. The sides of the ‘head board’ have carved detailing and the bed itself stands on beautifully turned feet with brown porcelain castors. The upholstery, which is in good condition, has a button finish and complementary braid trim.